This 3 page quiz has six parts covering noun phrases, prepositional phrases, participial phrases, gerund phrases, infinitive phrases, and appositive phrases. Each section has a short introduction and then directions for the exercise and a sample. 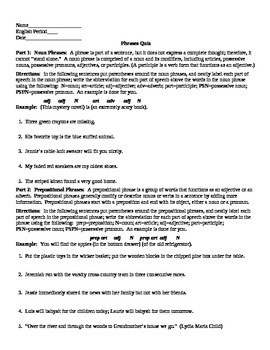 Each part has five sentences for the students to complete. Part 4: Gerund Phrases: A gerund phrase comprises a gerund and its modifiers. A gerund is a verb form that functions as a noun. Like the present participle, a gerund ends in –ing, but a present participle is an adjective, and a gerund is a noun. To avoid confusion with these two –ing words, decide how they function in the sentence. 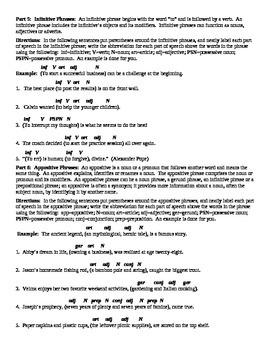 Directions: In the following sentences put parentheses around the gerund phrases, and neatly label each part of speech in the gerund phrase; write the abbreviation for each part of speech above the words in the phrase using the following: ger=gerund; N=noun; art=article; adj=adjective; adv=adverb; prep= preposition; PSN=possessive noun; PSPN=possessive pronoun. An example is done for you. Example: (Shielding the soccer ball) gave Jake an advantage over his opponents. This quiz is comprehensive, and I use it as a "teaching quiz" after we finish my "Phrases Worksheet." We correct this together in class because its inclusive nature would take too long for teacher correction. This is a very good assessment of student mastery/understanding of phrases. A 3 page ANSWER KEY is provided.